The AGM of the Friends of the Meadowridge Common was held on Monday 27 February and followed by an interesting talk by Ineke Moseley, a member of the team of photographers and botanists of the Friends of Silvermine who have photographed and documented the flora of Silvermine, entitled: “Flowers of the Southern Peninsula: rarities, endemics and pollination strategies”. 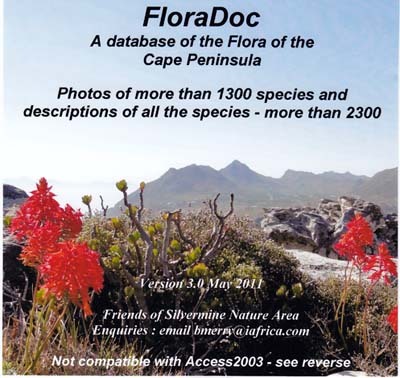 Ineke and Corinne Merry gave a demonstration of their database of the flora of the Cape Peninsula, FloraDoc, which documents all the flora you are likely (and unlikely!) 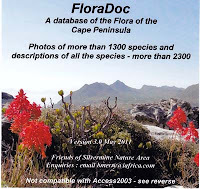 to come across on the Cape Peninsula - most of them accompanied by great photographs for easy identification. It is a great resource, and costs R150. For more information, click here. One of the Friends of Meadowridge Common, Olwen Gibson, who is an accomplished botanical artist, exhibited a set of four beautiful paintings of flowers that occur on Meadowridge Common. These will soon be available as a set of four cards which will be available to Friends of Meadowridge Common at a special price. Email Meadowridgefriend@gmail.com for information about how to purchase a set of these lovely cards.